High-end footwear brand Northern Cobbler opened its first retail store today on Queens Road. Interest has been building in the goings-on at number 104 since renovation of the interior began a couple of weeks ago, and rumours that the new business was going to combine a shoe shop and café had really got people talking. So what’s the story behind Clarendon Park’s newest addition? Is it a coffee shop that also sells shoes or a shoe shop that also sells coffee? And what’s a fish wearing a monocle got to do with any of this? Stick with me readers – Clarendon Spark has the answers. Built in 1890, 104 Queens Road has a history that dates back to the early days of Clarendon Park’s existence. It’s right on the corner of Queens Road and Clarendon Park Road and is an attractive building with a cute turret and big windows looking out onto the busy junction – perfect for people-watching. Until recently the building was rented by Billson and Sharp Solicitors, but now there’s something a whole lot more intriguing in store. 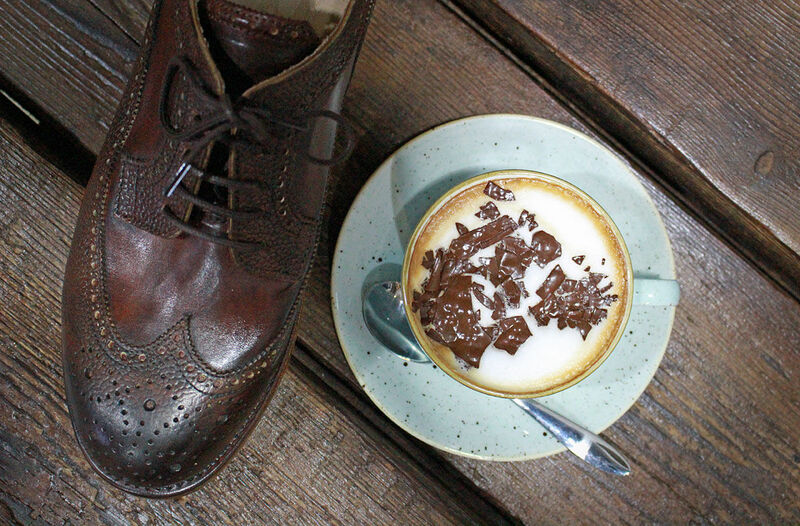 Shoes and coffee – a match made in heaven? My first impression on walking through the door is that this is a modern, stylish coffee shop, designed by someone with a keen eye for the very popular modern-vintage trend. There are antique scales (the type that weigh stuff, not fish scales, stop thinking about the fish) on the counter, heavy wooden tables and a few pieces of carefully chosen retro furniture. Nothing is overdone – it’s all very simple and uncluttered, with just a few nods to an earlier age giving it a pleasant gentleman’s club vibe. It’s easy to overlook the shoes at first, or even if you do notice them, to assume that they’re just part of the quirky decor. 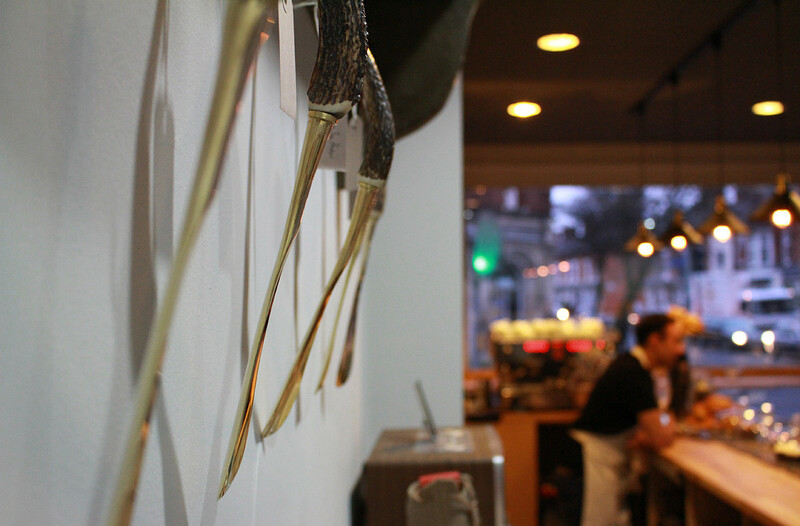 A dozen or so are heel to toe on narrow shelves along two of the walls, and a couple more pairs are displayed in one of the windows. You’d be forgiven for thinking this was just a regular coffee shop owned by someone with a passion for leather brogues. So, more coffee than cobbler, at least on the surface. Just who is behind this business and what’s the thinking behind their eccentric new Clarendon Park venture? Co-founders of Northern Cobbler, Feroza Bham and Steffan Safhill, set the company up about five years ago. The duo met while they were working for Next, where Feroza was a buyer and Steffan was a footwear designer. Together they have created a distinctive brand of handcrafted, high quality, traditional footwear with a focus on top-quality design and attention to detail. Several months ago the duo were looking to rent an office space as the headquarters for their business, but when it turned out that it would be cost-efficient to rent something bigger they decided to go one step further and launch their first retail store too. Feroza told me that her and Steffan had both always liked the idea of having their own coffee shop but working in shoes it had never been an option. This new enterprise is something of a one-stop-shop – the building will be Northern Cobbler’s offices, showroom and retail shop in one, a well as offering them the opportunity to experiment with a bit of café culture. 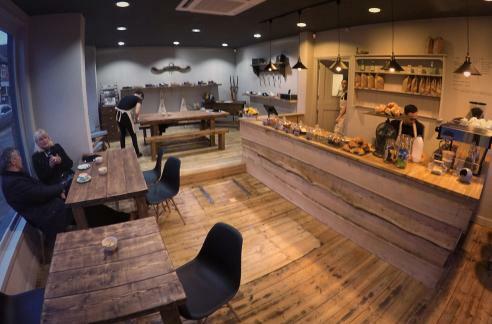 They have employed a small team of staff who share their enthusiasm about the brand and are keen to chat to customers about the vision behind the shop while preparing your coffee. Although the idea seems unusual at first, I think I get it. Northern Cobbler shoes are seriously pricey. We’re talking £200 at the cheapest end of the range. They’re clearly selling extremely well as small, specialist collections in larger, luxury shoe stores like Poste, but is there enough of a market in Leicester to make a dedicated retail shop worthwhile? No-one wants to be renting a big unit full of eye-wateringly expensive stock for the benefit of just a handful of potential customers, while potentially alienating residents and other local businesses. On the other hand, a bustling café in a vibrant part of town, which will raise the profile of the brand and provide an additional form of income is a far more appealing proposition. With this in mind, Clarendon Park starts to look like a very clever location choice. Well enough of the espadrilles – what of the edibles? Well, Feroza and Steffan have scoured the globe to source the best materials for their footwear, as well as to identify the most skilled craftsmen. Happily, this same commitment to quality can be found in the items for sale in their café. The menu describes the Northern Cobbler coffee blend as “a Brazilian Icatu Yellow and Ethiopian Yirgacheffe Bourbon blend,” a description which intimidated me just a little. Although I’m partial to the odd espresso I’m no coffee expert, so I’m relying on others for a review of NC’s loquacious brew. Barista Oz described it as a “rich and bold” blend. Fellow customers I’ve spoken to have echoed this, and added “smooth” and “smoky” to the mix. Someone else described it as having a “leathery” tang, but I suspect this was a psychological reaction caused by sitting next to a leather brogue while drinking it. 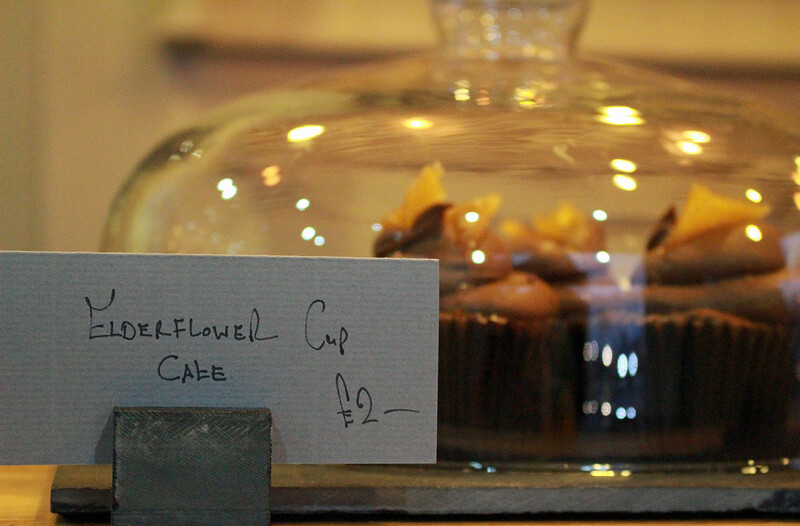 There is an excellent selection of pastries, all displayed on the counter under pretty glass cloches. Crowd-pleasers like fresh croissants and salted caramel and peanut slices are available, as well as slightly more unusual offerings, including elderflower cupcakes. For those who don’t like coffee there is also hot chocolate and a small but carefully selected range of fruit teas. Considering the cost of Northern Cobbler’s shoes you might expect prices in the café to be exorbitant, but they’re entirely in line with those elsewhere in the area. You can pick up a large cappuccino and a generously proportioned salted caramel cupcake and have plenty of change left from a fiver. There’s only one thing left to clear up, and that’s the mystery of the fish. It’s an upper-class kinda fish wearing a top hat and a monocle and it carries with it an air of superiority, if you can imagine such a thing from a fish. I couldn’t work out what a fish had to do with shoes and then I realised – it’s a cobbler – obviously! And of course it’s a posh cobbler because the shoes they sell are posh – mystery solved. Except it isn’t, because it’s not in fact a cobbler, but a sea bass. Apparently ‘Sea Bass’ is the nickname of one half of the Northern Cobbler team. Who’d have guessed that? Northern Cobbler is a lot of fun – a concept store, an anomaly and a deliberately offbeat experiment designed to get people talking. It was clear from the reaction of other customers when I visited that people were confused by the hybrid personality of Queens Road’s newest shop, and I suspect that’s partly the idea. There aren’t many coffee shops where you can also try on and buy a pair of shoes, or browse through a book about the history of loafers. Pop in, grab a coffee and embrace the kookiness. And don’t worry if you still don’t quite ‘get it’ – that’s all part of the charm. My favourite thing about Northern Cobbler? It’s open until 6.30pm on weekdays, which means I can wander down the road and enjoy nearly an hour’s chilled-out evening café ambience after my frazzling commute home from work. In fact I’ve got a feeling that quite a few of this blog’s subsequent posts will be penned while sitting at one of NC’s rustic wooden tables. An unconventional shoe shop/café at a crossroads right in the middle of the action – where better to write the blog from the heart of Clarendon Park? Great post on the new Northern Cobbler! I have only recently started blogging so shall be making my way down Queens Road and shall be sure to try it out now!